Welcome to our EMQ (aka emqtt) how-to series. EMQ is a distributed, highly scalable and easily extensible MQTT broker written in Erlang. It fully supports MQTT standard 3.1 and 3.1.1. EMQ can be deployed in single node mode or in cluster mode. Being deployed on proper hardware, a single EMQ node can serve about one million clients. If you are going to deploy it in production, cluster mode is recommended for its high-availability, regardless of the scale of deployment. EMQ is extensible by plugins. There are several plugins come with default installation. Also, you can write your own plugins. In this how-to, we will cover the installation, the clustering and the plugins. You can get the full feature list of EMQ from its github site. Installing EMQ is quite straightforward. If you are using a zip package, just unzip it to where you want it to be installed. A zip installtion is quite convenient for development or for multiple installation on same box. If you are using a Linux installation package, then run the package manage tool on your Linux distribution. This way of installation is recommended for production. To install EMQ using the installation package, you might need the root/sudo privilege. In some circumstances you might need install lksctp-tools first to satisfy the requirement to run Erlang/OTP. emqttd 2.3.1 is started successfully! After that the EMQ is successfully installed, all the necessary configurations are set with a default value, the MQTT broker service is ready. If you want configure it to meet your specific requirements ,you will need to change the default configuration or add some new ones. If the EMQ is installed using the installation package, config files can be found under the ‘/etc/emqttd’ folder. If it is installed using the zip file, the config files are under ‘patch-to-emq-installation/etc/’ folder. ## Max ClientId Length Allowed. After successful installation of EMQ, we will try put multiple EMQs into one cluster and let them work together. Clustering is a commonly used technique when more performance is needed or high availability is required. An EMQ cluster works in Active-Active mode, that is, every node in the cluster is active, no matter how many nodes there are in the cluster. there is no master or stand-by nodes, means also there will be no fail-over process when a node is down. Clustering of EMQ nodes is straight-forward. One cli command is all what we need. Assuming we have setup two EMQ nodes, the nodes name are emq1@192.168.195.131, and emq2@192.168.195.172. The two nodes are up and running. 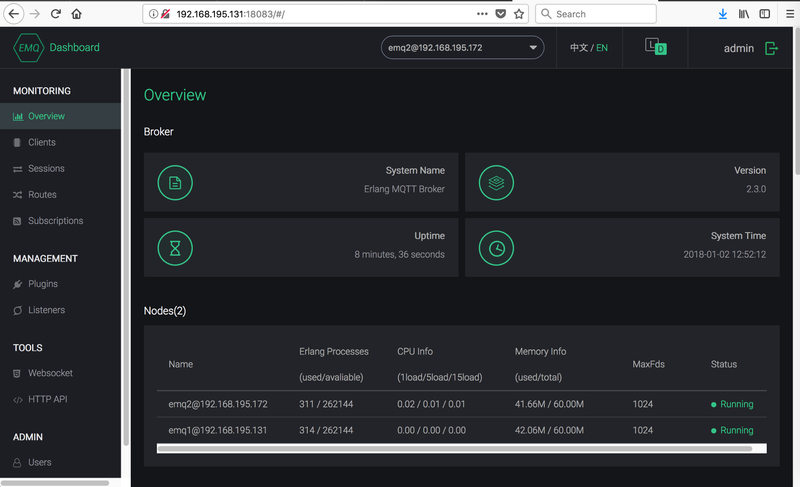 We run following command on the node on which the emq2@192.168.195.172 is running. The above cli uses the emqttd_ctl tool with the cluster command to let the emq2 node join the emq2 node and builds a cluster. 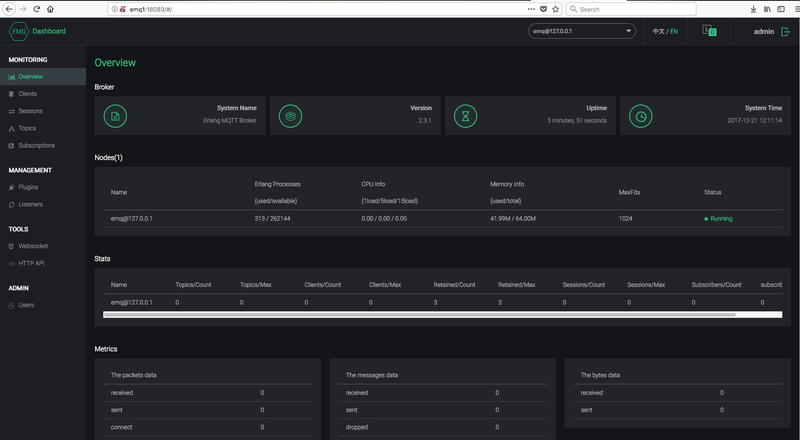 When the clustering is successful, it also returns the cluster status, we can see that the two nodes we pre-configured are now in the cluster. 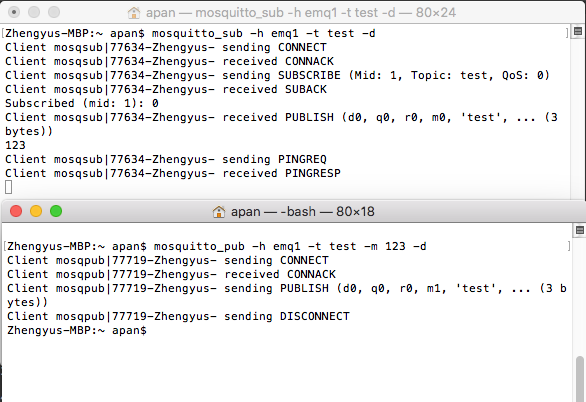 We verify the cluster with mosquitto tools by sub to one node and pub to the other node and see if the subscriber can receive the message. If the subscriber get the message sucessfully, it means that the message is routed in the cluster from one node th another. We can check the status after a node has left by cli or on Web Gui. It is the same as we’ve done above. Plugins extend the functions and performance of EMQ. EMQ comes with some plugins, they are configured by separated conf files (Each plugin has it own conf file). the conf files are collectively stored in the etc/plugins (by ZIP installation) or the /etc/emqttd/plugins (by package installation) folder. Beside the plugins come with the system, you can also write your own plugins to extend the EMQ. We will have a article for how to write a plugin. Next we will demonstrate how to enable and config a plugin. This time we take the emq_auth_redis as an example. 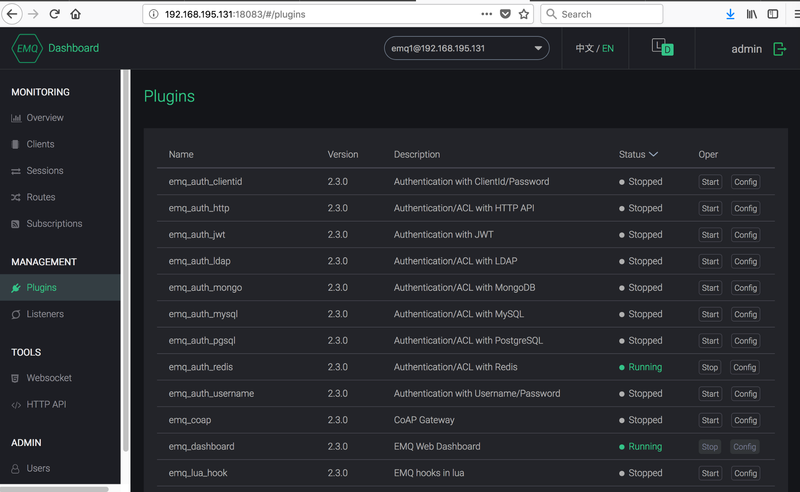 This plugin make it possible to store the auentication and authorization data in a redis server and check them when it a client try to access the EMQ. Before we start with this plugin, make sure that the anonymous access is disabled and the ACL mismatch access is denied (see the emq.conf example above). ## HSET mqtt_user:<username> password "passwd"
Now we have a user john, his password is 123. John can subscribe to all sensors and he can publich to sensors/001, also, John can both publish and subscribe to topic alarm. At last, we will verify the it with mosquitto client tools. Connection Refused: bad user name or password.